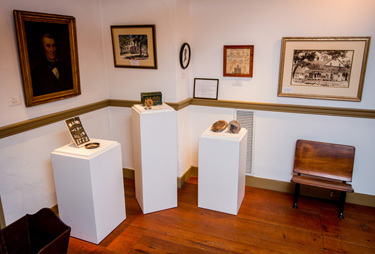 Learn about our Colonial and Victorian Heritage and the architectural differences between Federal, Queen Anne and Greek Revival homes. We’ll also give you fun, fact filled stories you may never have heard about Newtown. Hessians? Quaker Bank Robbers and Horse Thieves? We’ll tell you all you want to know about William Penn’s “New Town” and maybe pick up a few ghosts and gravestones along the way. Please join us on Sunday May 20th, 2018 for this fun event. Tours will last approximately 40 minutes and run at 12:15, 1:15, 2:15, 3:15, 4:15 PM. Arrive 15 minutes prior to your departure time. Boarding and unloading is at the Stocking Works, 301 S. State St., Newtown. Online tickets are now sold out. 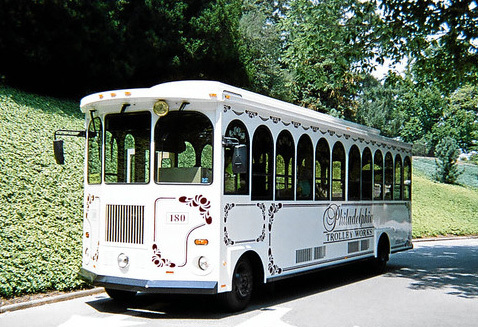 Due to the popularity of the Trolley Tour, only a few select tickets are available. Remaining tickets will be available by reservation only. Please call Kathy Gonsalves at (215) 860-5468 for reservations. The cost is $15.00/Adult and $10.00/children 12 and under. Children under 2 ride free with adult. Due to the age of the vintage trolley, we can only accommodate one non-motorized wheel chair per tour. Please call Kathy Gonsalves at (215) 860-5468 with any questions or any special needs requests.